Simulate heart beats with your molecular model. 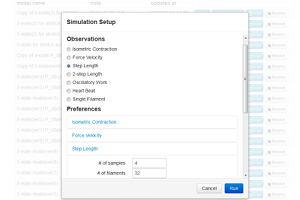 XB Modeler provides a heart beat test that lets you study relations between microscopic laws of molecular kinematics and macroscopic behavior of a heart. You can also perform a set of basic tests with your molecular model from single filament tests to tissue level tests like experimentalists are doing. It works on your web browser. XB Modeler is a fully-integrated modeling & simulation environment that works on your web browser such as Chrome, Firefox, Safari 6+, and IE10+. No need to install or maintain anything special on your PC. No programming required for modeling. 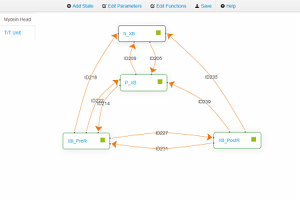 XB Modeler provides a simple UI to design your molecular model just by defining transition rules between states of myosin heads or troponin/tropomyosin units on a state diagram. No programming required for simulation. XB Modeler makes it easy to run simulations from single filament test to heart beat test with a simgle UI. Simulation parameters are configurable to suit your needs. It's free to get started.